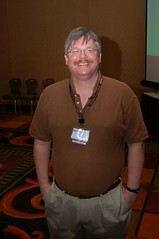 Yesterday I wrote up an overview of Tom Fitzpatrick's AVM tutorial last week at DVCon. Today, I'm going to discuss Harry Foster's presentation on writing assertions. If you want to know what assertions are and what they are for, check out Harry's book – Assertion Based Design. If you don't have time to read the book, the concept behind assertions is relatively simple. Basically, when someone designs a module, they often make a set of assumptions about the inputs and outputs of a module, legal state transitions, etc. Those assumptions can be captured as a set of assertions. If the assertion is ever violated, the simulation will fail, allowing a user to easily trace a problem back to its source. Assertions can also be used to provide functional coverage information for a design. By codifying verification best practices, Tom hopes to change the perception that "verification is an art form". His view? That verification is really more like "paint by numbers" and that a large portion of the work can be simplified down to a series of steps. It's over! DVCon 2007 is officially finished. 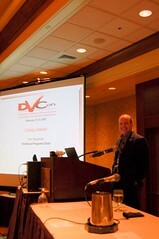 Tom closed out the conference by announcing the DVCon best paper award winners for this year. He also announced that the final attendance was 710, a new record! I'd like to thank Tom and the rest of the conference organizers for hosting a great event, and being available to help me out with info for stories over the course of the week. There are many technical challenges facing the EDA industry. Though not everyone agrees on the details of how to move forward, the thing that struck me most about this conference is how everyone is converging on some common ideas. For example, though there is heated debate about which low power standard should prevail, there is agreement about how to deal with low power (the two competing standards are apparently quite similar). Similarly, in the verification space there is starting to be a convergence of opinion that functional coverage, assertions, and constrained random testing are important. Not everyone agrees on the exact tools and languages that should be used, but there are a lot of dedicated, hard working engineers on all sides of the problem whose goals are to get these problems solved. 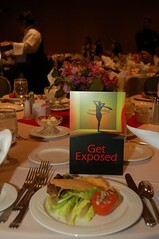 Stay tuned - I've got more to say on the conference in the coming days. "FEV’s Greatest Bloopers: False Positives in Formal Equivalence" by Erik Seligman, Joonyoung Kim Digital Enterprise Group, Intel Corporation, Hillsboro, OR. "Towards a Practical Design Methodology with SystemVerilog Interfaces and Modports" by Jonathan Bromley, Doulos Ltd, Ringwood, U.K. Updated February 26, 2007: Switched out picture of John with a new and improved version. 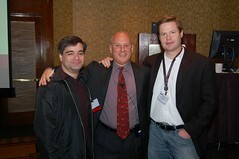 Thursday morning after the keynote I had the opportunity to meet John Cooley of Deepchip fame. If you've been at DVCon the last couple of days, you may have seen me lugging around my camera for just such an occasion. I asked if I could snap a photo of John to go with my coverage of the keynote. "Sure, no problem", said John, "but would you mind if I took a shower first?" Fair enough, I said, so I waited until later in the afternoon to get this shot. Brett Cline: "So John - we haven't heard about your sheep for awhile... did you guys break up?" 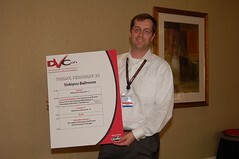 I'll be back online tomorrow with a final day of coverage of DVCon 2007. I've still got quite a bit of material I haven't had time to write up yet from the last few days. If you don't want to miss anything be sure to subscribe via email or RSS to save you from the trouble of having to check back here from time to time. This morning Gabe Moretti kicked off the keynote with a brief overview of how the conference was going. According to Gabe, 250 people attended 5 tutorial sessions on Wednesday. The exhibitors' hall was full, and some exhibitors who wanted to reserve a space in the hall had to be turned away. Next year, the plan is to have a larger exhibitor floor. Tom Fitzpatrick from Mentor provided insight into the paper submission process. 99 papers were submitted this year. 33 were accepted. 5 tutorial sessions were submitted, and since all 5 were deemed worthy, a decision was made to have more tutorial sessions. A new track for "advances in research"
This year, the winner of the Best Paper award will receive $2000. Unlike in previous years, there will only be one prize (previously, two papers were selected – one for design and one for verification). Attendees should cast their vote for the best paper by 3pm Friday afternoon. Moshe Gavrielov, General Manager and Executive Vice President of Cadence's Verification Division provided the keynote this morning at DVCon, entitled "Taking An Enterprise-Wide Approach to Next-generation System-level Development". The overall theme of the talk was to demonstrate that verifying today's complex systems is an entirely different problem than that faced in the smaller designs of the past and that in order to solve this new problem, a more comprehensive solution is needed. Fliers were given to all of the attendees of the Low Power Panel over lunch today announcing the new SystemVerilog User's Group. An interesting choice for the image for the front of the card, but the back contained a link to the site. Jason Sprott, VP of Consulting with Verilab (my employer) is one of the members of the Steering Committee, as are Dennis Brophy and and Tom Fitzpatrick from Mentor, Cliff Cummings, Hans van der Schoot, Kevin Silver from Denali, and Jonathan Bromley from Doulos. If you're interested sharing your SystemVerilog experiences with other users, head on over to the site and check it out!